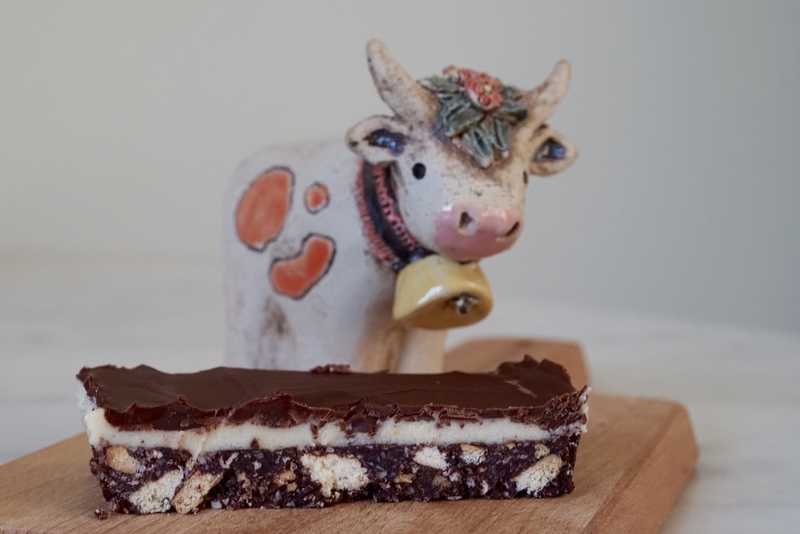 I like to think that Nanaimo Bars are part of the reason why I'm still in Switzerland. Five years ago I hosted a Canada Day party. I invited all of my Canadian friends, as well as some Swiss friends and expats. I planned an exclusively Canadian menu: Caesars to start (they don't have Clamato, so I drained cans of clams into tomato juice), Poutine (dry mozzarella replaced the cheese curds), and Nanaimo Bars for dessert. I made a mountain of food. But a few hours before people were set to arrive, I started getting cancellations. Then I got a message from my friend Mary, asking if she could bring one of her husband's colleagues. Of course! I didn't drain those clams for nothing. "He's really cute," she added, "perfect for you." By the time Mary, her husband Richard, and his colleague, Sam, arrived, every other guest had cancelled. 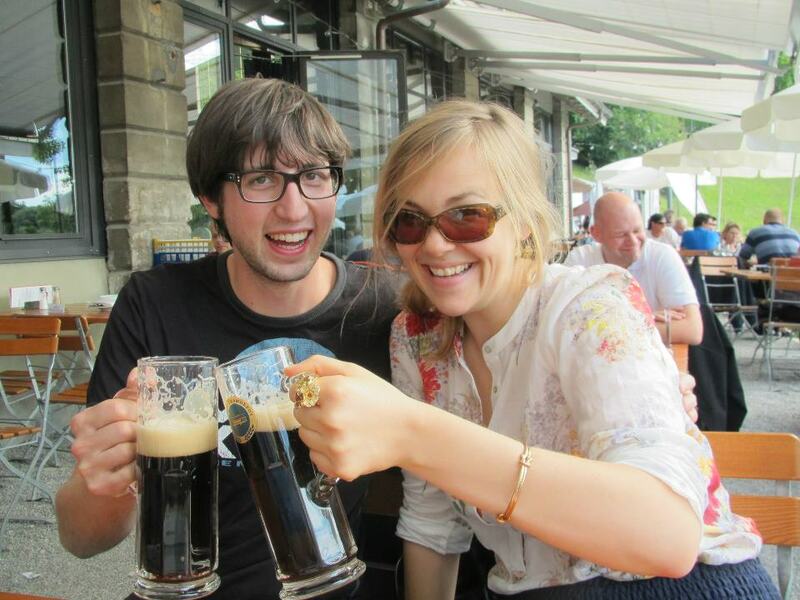 I was alone, surrounded by my piles of Canadian food, and confronted with a super cute Swiss mathematician who thought he had been invited to a big Canada Day party hosted by a guy named Andy. It looked just like the set-up it was. Nanaimo Bars sealed the deal. At the end of the night Sam took home the leftover bars...and my email address scrawled on a post-it. Anyway, five years on, Sam and I are married. And I still make him Nanaimo Bars every Canada Day. I use a recipe that is a mix between the recipe that the city of Nanaimo has on their website, and this Canadian Living recipe. Melt the butter over a double boiler, then add the cocoa powder and sugar. Mix together until smooth. Remove from heat and wait a moment until it cools slightly, then vigorously whisk in the egg, making sure it doesn't curdle. Stir in the cookies, coconut, and salt. Spread this layer into a 20 cm / 8 inch square pan using an offset palette knife. Bake in oven for about 10 minutes. Let cool. Whisk together until smooth and creamy. If the mixture is too thick to spread, simply add a drop more milk or cream. Make sure the base is fully cooled, then spread this over top. Keep in the fridge until you are ready to add the top layer. Melt the chocolate and butter over a double boiler. When it is smooth, spread it over the custard layer. Cover and refrigerate until the bars are solid. They taste best out of the fridge or freezer. I like to use metal tart pans with removable bottoms. This makes it really easy to get the bars out once they are cooled. Sometimes I make them in a round pan and cut them into long wedges, which makes a great plated dessert. 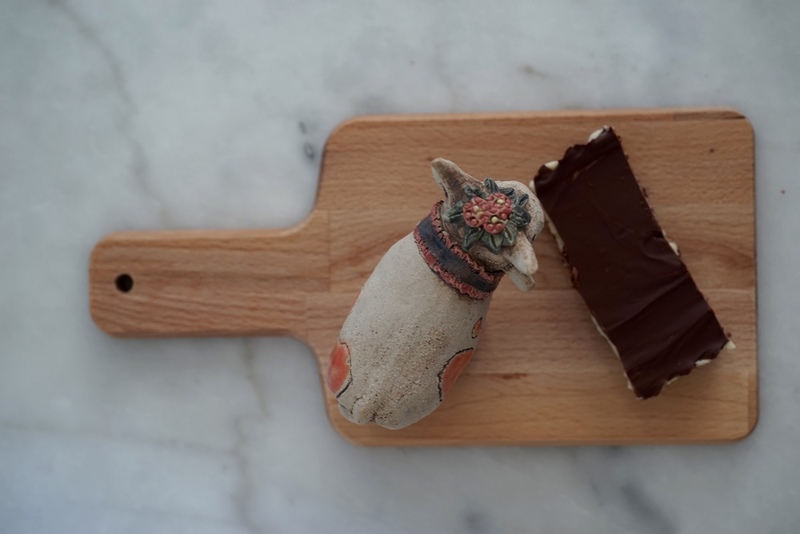 Before cutting, dip your knife in hot water to prevent the top chocolate layer from cracking. They can get melty and messy, so it's best to keep them refrigerated. 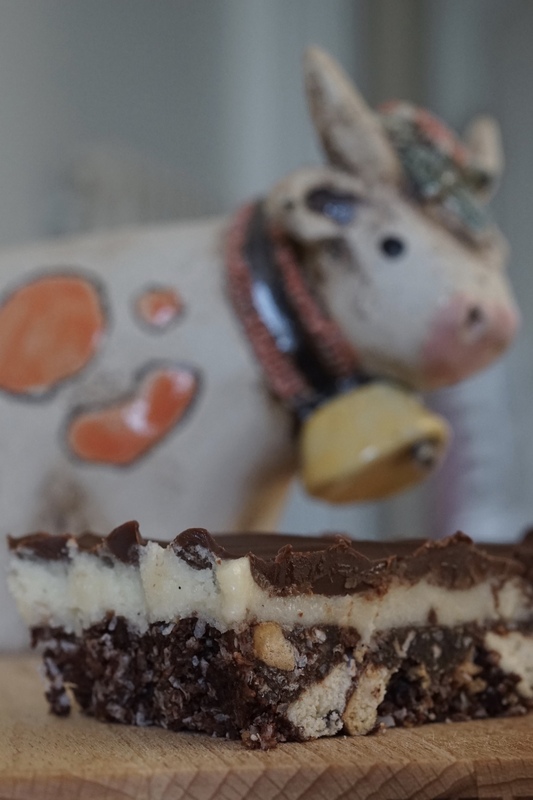 Canadian Nanaimo bars and a Swiss cow, pictures by Sam.